'Disruptive Innovation.' The words themselves are a contrast in sentiment—excitement sitting on a bed of apprehension." A number of trends lead many professionals and experts to believe 'disruptive innovation' is just around the corner for the health care industry—innovation that could fundamentally change business models in health care and finally drive down costs. Indeed, a recent survey conducted by NEJM Catalyst suggested that healthcare stakeholders—executives, clinical leaders and clinicians—believe "innovation will come from beyond traditional health care organizations," and this kind of innovation is necessary "to transform the U.S. health care sector." Only outsiders can overcome the limitations of the current landscape, from better technology to creative payment models... Whether talking about disruptive innovation in hospitals, health care IT, or primary care, respondents say focused start-ups will lead the way." Why might this be the case? Disruptive innovation generally comes from outside the industry—from new startups with business models alternative to the established industry order that can focus on providing low-cost alternatives to traditional services. Why now? In theory, health care has long been ripe for disruptive innovation—we'll discuss that in a moment—so a question remains: why is innovation in health care so difficult? Or rather, with a constant stream of technological innovation, why haven't we seen disruptive innovation in health care, already? Before we can discuss the trends that might push along disruptive innovation in the near future, or answer those two questions, we have to understand the fundamental theory behind disruptive innovation. Making no bones about it, "disruptive innovation" is a buzzword. By that I mean there's plenty of misinformation out there, or rather, popular connotations that bear no relation to the actual theory laid out by Clayton M Christensen, the Harvard Business School professor who studied and coined the term. Fundamentally, a disruptive innovation is a low-cost alternative to existing services that arises via market forces when firms focus on "sustaining innovations" that eventually overshoot the needs of average consumers. Technology is often involved in disruption—where it facilitates a lower-cost business model. 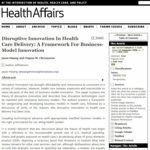 From Disruptive Innovation in Health Care Delivery: A Framework for Business-Model Innovation; Hwang, Christensen, Health Affairs, 2008. 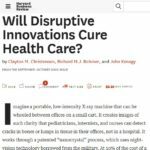 "In any industry, a disruptive innovation sneaks in from below," writes Chistensen, Richard MJ Bohmer and John Kenagy in a 2000 article in Harvard Business Review, "Will Disruptive Innovations Cure Health Care?" The above graph is quite descriptive, though it requires some explanation. Existing firms in an industry generally—and rationally, to a degree—focus on "sustaining innovations," or improving existing services to meet the needs of the most demanding and most profitable consumers—the first solid arrow in the graph represents an existing firm focused on sustaining innovations. In a health care context, a sustaining innovation may be an innovation in customer service or patient education or a new tool to help doctors solve the most complex of patient problems—both are admirable value-adds, but the first is something that the least demanding consumers might not require, and the second is something the majority of patients probably do not require. Both innovations may increase the cost of doing business for the provider, and thus cost of care for all consumers. 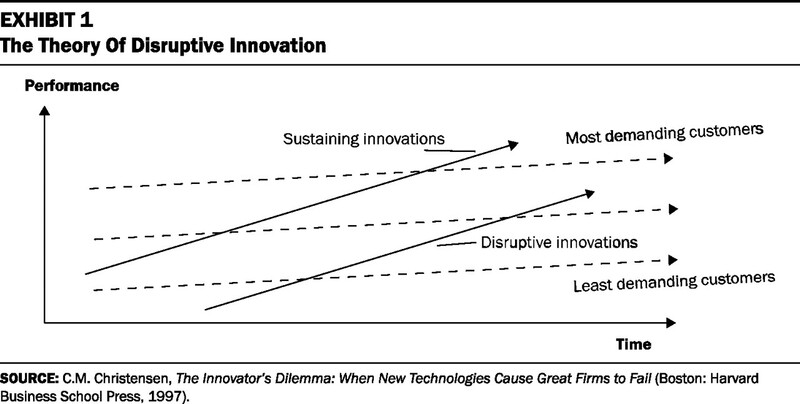 In this way, sustaining innovations eventually overshoot the needs of the majority of consumers—represented by the middle dotted arrow—making it possible (in a free market) for disruptive innovations to enter the industry—the second solid arrow in the graph. These firms enter the market "from below," focusing on the least-demanding customers with a low-cost alternative business model. Retail "minute clinics" are a good example of disruptive innovation in health care. For a patient who just needs an examination, treatment and prescription for a minor illness, or a routine vaccination, physical or screening—a retail clinic is a convenient and low-cost alternative to a doctor's office or urgent care visit. Those consumers won't get the additional value that sustaining innovations have created in the doctor's office or urgent care facility, yet—but they will get what they're looking for at a lower cost. Disruptive innovations, with lower-cost business models (often driven by new, lower-cost technology), add more value to their services over time through further innovations. That is where "disruption" comes in—when the lower-cost services have improved to the point where the majority of consumers' needs are met by the lower-cost business model, existing firms working with a traditional, higher-cost business model are forced out of the market—unless they've adapted. I admitted it was a buzzword earlier, but it's more than that—disruptive innovation is also a well-observed phenomenon that explains, with a macro focus, "how complicated, expensive products and services are eventually converted into simpler, affordable ones," write Christensen and Jason Hwang, MD in a 2008 article in Health Affairs. And when health policy discussions are largely focused on costs spiraling out of control, we have to bring a good understanding of disruptive innovation into those conversations. While health care has seen some disruptive innovation since Christensen and colleagues wrote in 2000, 17 years later we've seen little true disruption—traditional business models and sustaining innovations still rule the day in health care. In part two of this blog series, we'll discuss why truly disruptive innovation is so difficult in health care and the obstacles disruptive innovations might meet. In part three, we'll look at some trends which could push disruptive innovations past these obstacles. Are you ready for your own disruptive innovations? Disruptive innovations affect all industries, including associations of health professionals—that's one of the reasons the Health Professions Network is hosting an Association Summit in Chicago July 26-27. This event will be a rapid fire brainstorming session on issues facing associations of non-physician health professionals, issues like: membership as a product, apathy inside & out of the organization, limitations to volunteerism, work-life balance of new professionals, regulatory reform, licensing board consolidation, advocacy on a federal level, generational differences & millennials, and organizations' willingness to experiment—and more. We're going to be looking at these trends to see if we can't come up with some disruptive innovations of our own—a meaningful and unique opportunity to get together with colleagues and learn what's working, what's not, what might work for your organization. The Health Professions Network has its own history of disruption. The last time we called a summit in 2010, conversations resulted in the organization of the Health Professions Pathways Consortium (H2P), a collaobrative initiative which was awarded a $19.6 million grant. The grant was one of the largest ever awarded by the Department of Labor through a discretionary grant from the Trade Adjustment Assistance Community College and Career Training program with the aim of better preparing the target population of trade-displaced and lower-skilled workers and other beneficiaries for high-wage, high-skill employment. That investment was quickly put to work promoting opportunity and diversity in healthcare around the U.S.. I can't guarantee a $20M ROI on our upcoming summit, but you might just bring back your association's next $2,000 or $20,000 idea and put it straight to work.